Peerless-AV SmartMount Flat Panel Trolly 55"- 98"
Introducing Samsung's NEW 75" eBoard solution. Unleash the potential of your presentations. Featuring a pre-assembled Touch Overlay and a variety of collabouration-enhancing capabilities, the Samsung e-Board display alleviates misconceptions that digital display writing is complex and unnatural. Instead, the DME-BR’s touchscreen offers a smooth and comfortable writing experience. The DME-BR display’s hand touch function enables up to 10 different participants to touch the display’s screen using two fingers to make content selections, comments or edits, with those individual actions easily recognisable to the entire group. This versatile usability promotes efficiency and productivity by compiling individual feedback within a single source and offering greater visibility to all participants of discussed content. For added convenience, the Samsung e-Board display also comes with a hand eraser tool useful for erasing larger areas of the screen. Instead of users having to search for and work through a specific removal function key, the simple and intuitive hand eraser makes content revision fast and user-friendly. Today’s business and educational environments require advanced compatibility for users to easily read and share content. 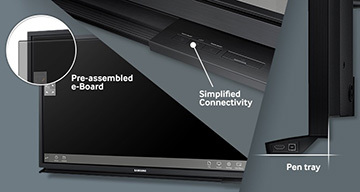 Through its enhanced and versatile connectivity, Samsung’s e-Board display allows users to access, share and revise content via their own laptops, tablets and smartphones. 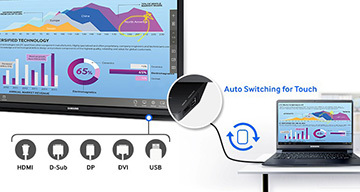 This superior connectivity stems from the display being equipped to support a range of signal input sources, including HDMI, D-Sub, DisplayPort (DP), DVI and USB ports, which are compatible with nearly all external devices. Furthermore, the Samsung e-Board display’s auto switching for the touch function eliminates the headache of needing two different cables to use touch with a notebook PC. Instead, the display features an easily assessable touch out cable (USB upstream) on the side of the front pen tray. Users just need to plug the single touch cable into the USB, connect the cable to the notebook PC and setup source. Together, these integrated solutions simplify multi-device setup and connectivity, as well as ensure convenient utilisation of the display’s advanced touch capability. The Samsung SMART Signage e-Board display’s pre-assembled design allows users to comfortably install, control and work with the all-in-one e-Board solution. As part of its professional-grade design, the Samsung e-Board display incorporates a front pen tray for convenient storage and easy access to display components. 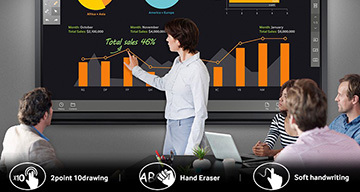 With a design format resembling that of an analog white board, the Samsung e-Board helps ensure user familiarly and seamless technology adoption, while also bringing design sophistication and advanced functionality to business and educational environments. Additionally, the display’s design positions simplified hot keys on the front and side of the pen tray. The shortcut hot keys allow users to easily locate and select frequently-used functions, including touch on/off, quick menu, power on/off, touch out USB and HDMI, with the simple push of a button. With the Samsung SMART Signage e-Board, business professionals and educators can economically utilise space while delivering the functionality essential for effective collabouration and productivity. In this era of information overload, it has become critical to use time effectively to get your message across, while ensuring that your auoSence remains captive. A challenging task, however, Samsung MagiclWB S2 was built to give you a new layer of support when seeking to deliver vivid presentation-oriented meetings. This convenient solution comes embedded in the DME-BR series, which brings a new dimension of portability and ease-of-use that catapults it to the forefront of e-board technology. MagiclWB S2 is perfectly tailored to be used in the dynamic spaces and sellings of modem offices through use of a range of feature- rich capabilities that have been crafted to make your presentations more productive, regardless if you consider yourself to be a quick or slow adopter of technology. Gone are the days of educators needing to factor in the logistics of a typical projector system and the pitfalls and distractions that they come with. Samsung e-Board converts these past shortcomings into strengths through effective utilisation of FHD displays and interactive whiteboards. New lines of communication between teachers and students can now be forged, through data and file- sharing capabilities between the e-Board and devices of students, thus further creating an interactive presentation environment that holds attention spans and creates opportunity to diversify learning approaches. 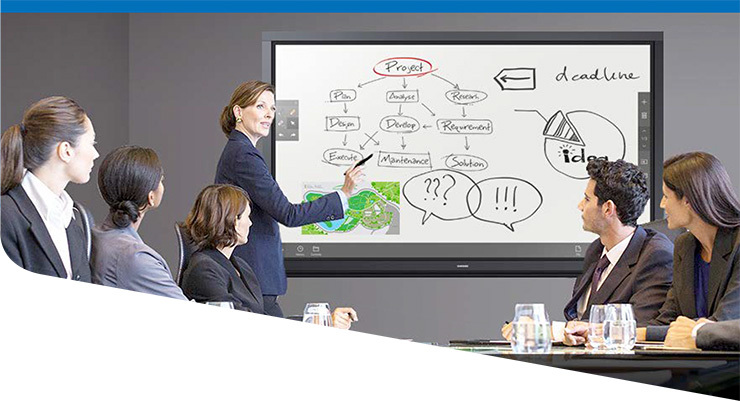 Samsung e-Board is well suited to help you convert your classroom into an intensive and engaging learning environment. The touch interfaces that you have come to know and depend on for daily use, such as with smart phones, have transcended personal use and are now embedded in e-Boards. Employing those same gestures, habits and ease-of-use, the learning curve for adjusting to Hand Touch e-Board will be understandably short. Leveraging Samsung's aspiration for creating dynamic and highly usable platforms. 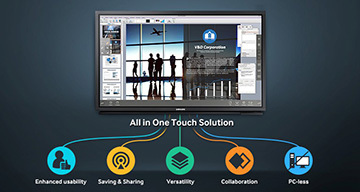 Samsung MagidWB takes your e-Board experience to the next level with heralded innovations that allow for your educational and business environments to become more immersive and your audiences to become more engaged. Let Samsung MagiclWB lead your way forward to realize new horizons of communication.